‘We’re ready. We could be the most ready company in Canada with our certification and our quality system,’ says Kevin Bryldt, CEO of Inkubate Packaging near Edmonton. Inkubate specializes in boxes, cartons and paper packaging. For the small-business-dominated world of packaging, the profits of supplying to the recreational marijuana market could be impressive. Kevin Bryldt and Carol Alexandruk are confident their packaging firm is ahead of the game in the recreational marijuana market, even though the rules of that game haven't yet been set. Inkubate Packaging, a small company with six employees in a facility 10 minutes from the Edmonton International Airport, has been working with the industrial hemp industry for two years, dealing with Health Canada and the need for quality control and security. Mr. Bryldt is confident that experience should translate to the marijuana industry. "The marijuana industry is so new. We're hoping the same traction [that it has achieved with packaging hemp products] happens. …We're ready. We could be the most ready company in Canada with our certification and our quality system." Inkubate specializes in boxes, cartons and paper packaging. For the small-business-dominated world of packaging, the profits of supplying to the recreational marijuana market could be impressive. After implementation of Bill C-45, which will legalize recreational cannabis, the domestic consumer marketplace could grow to between $8- and $9-billion per annum, says Allan Rewak, acting executive director of the Cannabis Canada Association, the national voice of licensed producers of medical cannabis. Getting in on the ground floor as a supplier is the opportunity packaging companies are eyeing. Some companies have capitalized already on the medical marijuana market. And entrepreneurs who package other products, including health food and similar items, are also considering their chances. The federal government is hammering out regulations for packaging and branding now. The government proposed to limit the colours and graphics on packages and include requirements for health-warning labels in a framework discussion paper, which has been circulating for the past two months. Glass bottles and some clear bags may be disallowed. The public consultation period ended on Jan. 20. Health Minister Ginette Petitpas Taylor says proposals are also being examined to include a tracking system to monitor the cannabis supply chain. The entire industry is expected to be tightly regulated for health and safety, and to keep criminal elements out of the sector. Mr. Bryldt and Ms. Alexandruk think the marijuana regulations will be similar to those for controlled natural health products, with which they now deal. For instance they already work with CBD, cannabidiol hemp oil. They built Inkubate's building which houses their package-making operation. It has Health Canada certification and an ISO 9001 quality-assurance designation. "This building was purpose-built for the medical industry, so it had to meet the regulations of Health Canada. You'll see everything is painted, the wiring is within the walls, the air lines are in the walls, hospital grade floors, wipeable walls …" Mr. Bryldt says. Inkubate's other tool in its competitive arsenal is an advanced industrial carton-converting laser, which cuts and scores boxes and small cartons and embosses codes and serialization to facilitate tracking products from plant to end user. The laser, unlike older package machinery, can use rougher material that does not have perfect straight edges. Inkubate's owners are beginning tests on using hemp fibre, the stalks left in the ground after harvesting, to produce boxes and cartons for hemp products, creating an environmentally sustainable cycle. New cannabis hemp regulations will enable the whole hemp plant to be used, adding value for farmers. Inkubate would still need Health Canada approval to use hemp fibre in this way. And that would have to be addressed if the company wants to use marijuana waste fibre. Mr. Bryldt says as the shape of Canada's regime for recreational marijuana became more clear, it became evident that there could be a gap on the processing and packaging side. The large licensed marijuana producers will likely have processing licences as well, but micro producers who are being encouraged to take a crack at the market would have a tough time coming up with the money for an appropriate facility and machinery for processing, Mr. Bryldt says. "When it comes to the micro growers, they're not going to be able to afford to put a quality-assurance person or put in SOPs [standard operating procedures] … we can show up at the door and say we'll take it from here," he says. And he adds that the company's facility, with its quality-control systems and security is a valuable asset. If the right company came along, he could move the packaging operation to an adjacent property and turn over the facility for marijuana processing. Mark Finkelstein, national sales director for PharmaSystems Inc. in Markham, Ont., is not surprised by the variety of companies now interested in the marijuana market. PharmaSystems has a separate brand and website for its medical marijuana supply business. The company has about 45 employees. It sells items such as bottles, jars, caps, bags, oral syringes and lab supplies to a number of licensed marijuana producers, Mr. Finkelstein says. 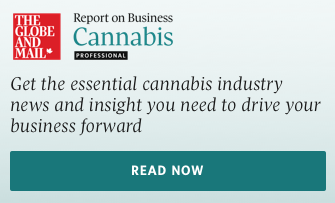 Right now cannabis supply is a small percentage of PharmaSystems' business. Mr. Finkelstein says the company is the biggest supplier of pharmaceutical supplies in the country but because it is privately held it doesn't disclose its annual revenues. Even after legalization Mr. Finkelstein says the company's main business will remain pharmacy, hospital and institutional supply. But he expects the cannabis supply side will increase. "The producers producing for medical will be producing for recreation. I don't think it's going to have a substantial change in what we sell and who we sell to. Hopefully it will increase the volumes of what we sell," he says. In the medical cannabis space, the product is mailed directly from the producer, so packaging firms sell supplies to the producer, which does the packing. That is the business model Mr. Finkelstein expects will continue for PharmaSystems. His packaging is unbranded so he expects producers will deal with any branding regulations. "I think there's a lot of opportunity out there and it's not an easy space to get into. Margins are fairly tight. The volumes are significant but it's a hard decision to get into it if you don't have an existing business. Cost and quality are going to win out," he says. "I would say most of the dominant players are already involved." Smit Jani, owner of Pouch Makers Canada Inc., a packaging company in Mississauga, is already supplying marijuana producers in Colorado and Nevada and business is picking up in British Columbia. His products are mostly bags and pouches. Pouch Makers provides packaging for the health-food industry and many other sectors, Mr. Jani says. The company has a food processing and packaging division as well. His company does about $6-million in business a year, employing seven people in sales and distribution and about 25 in production. The company is a separate entity in Canada but is related to a larger family-owned business based in India. Mr. Jani attends many of the large trade shows that are held across Canada for cannabis producers and suppliers. "We don't handle the product because there is too much hazy legislation around what you can and cannot do, so we just provide the packaging supplies," Mr. Jani says. For the U.S. market, he says the firm adheres to child and poison control guidelines and is developing child-proof zippers for bags, which will be in production in March. He says he is willing to go through any coming regulatory hoops. "As we mature and the industry matures, there will be changes which we are anticipating and I believe … it should be a fairly straightforward process," Mr. Jani says.